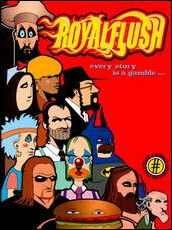 Get Awesome Royal Flush Stuff! Rob Zombie cover by Ed Repka! / Always Sunny in Philadelphia cover by Patrick McQuade! Nothing is luckier than Royal Flush Book Seven! This issue is so uber-stuffed that we had no choice but to make it two issues!This double-flipped cover is the biggest and best one yet featuring in depth feature interviews with horror and heavy metal master, Rob Zombie and the ever outrageous cast of It’s Always Sunny in Philadelphia.Plus we jam packed this sucker with interviews with Danny McBride, Lisa Lampanelli, John Waters, Roddy Piper, Tim Bradstreet interviewing Rob Halford, Roger Corman, Inside the Mind of Danny Bonaduce, Devo, Tenacious D salute Dio, Cheech & Chong, Frank Miller interviewing Jim Steranko, Lewis Black, Corey Taylor, Mike Birbiglia, Scott Ian, King Diamond, Volbeat, Slash, Lee Ving and many more. We also take the piss out of Sarah Palin, David Hasselhoff, Justin Bieber, Tiger Woods, Mark Zuckerberg, Lady Gaga, Mel Gibson, LeBron James, James Hetfield, Marilyn Manson, Gene Simmons and Patrick Swayze. 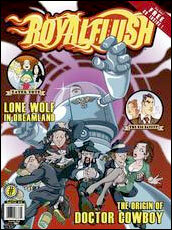 This issue also features a very special custom Royal Flush Fold-In by Mad legend Al Jaffee! Cover Illustrated by Señor Tim Bradstreet! 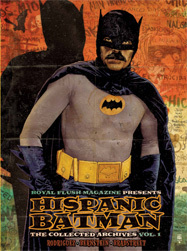 Royal Flush Magazine has finally answered your dreams, and painstakingly assembled all the Hispanic Batman adventures into one gigante limited-edition volume.Limited to 1,000 copies, each is perfect-bound, signed and numbered and available only at the 2010 San Diego Comic Con. But for a limited time you can Reserve your own copy. Illustrated and Hand Printed by Señor Steve Chanks! Gloriously reproduced in all the wrong colors, this “bootlegged” icon of machodom is ready and willing to hang triumphantly on your basement/man cave walls. Hand printed in 3 colors on ha-archival stock and limited to 100 signed and numbered pieces. Hugh Hefner cover by Robin Eley! Joan Jett back cover by Josh Bernstein! Cover story with the one and only Hugh Hefner! See his original comic book art from the ’30s and ’40s! Plus interviews with: Joan Jett, Ted Nugent, Basil Gogos, Leslie Nielsen, Hispanic Batman, Alice Cooper, Harvey Pekar, Jack Kirby, Frank Zappa, Dethklok, Jim Gaffigan, Brian Posehn, Jeffrey Ross, Danny Trejo, Jenna Jameson, Californication, Torche, Osaka Popstar, Lamb of God and 112 pages of comics, commentary and calamity! This is the magazine that slept with your girlfriend’s magazine! Don’t be the last on your block to own this monument of madness!! 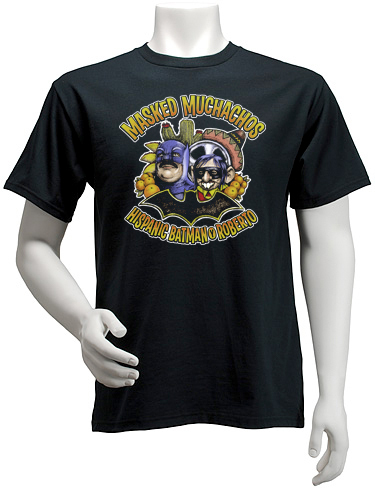 Hispanic Batman & Roberto T-Shirt – $17.00 SOLD OUT!!! 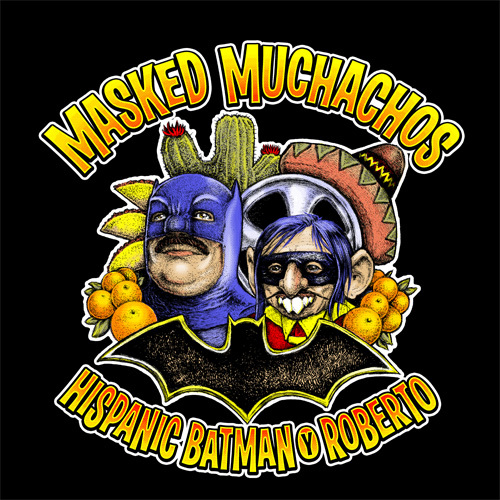 For over 10 years now, a loco mofo named Hispanic Batman and his pequeño compañero Roberto have been keeping the streets of South Central Gotham safe from villainous scum such as Hispanic Joker, ¿Señor Qué?, el Pingüino, and La Gatacita. Well The Flush think it’s about time we made a shirt to say thanks to our numero uno papi. 6 colors on a heavy weight Gilden T-Shirt. Joan Jett, Queen of Noise Poster – $19.99 SOLD OUT!!! 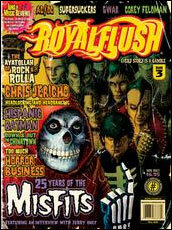 Royal Flush Magazine, Joan Jett and Blackheart Records have teamed up to bring you a special holiday treat! 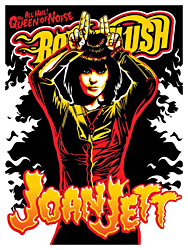 Based of the Royal Flush cover art of Joan Jett by Josh “Bootsy Rizzak” Bernstein, this silkscreen poster is 18″x24″ of pure rock and roll fury. Signed and Numbered by Josh Bernstein. Book Five – SOLD OUT!!! Patton Oswalt cover by the master Drew Friedman! Mindless Self Indulgence back cover by Cojo! Do it Yourself! The legends of American Punk Rock: New interviews with Glenn Danzig, Henry Rollins, Ian MacKaye, Jello Biafra and Chuck Dukowski. MC5: 40th Anniversary of Kick Out the Jams.The Art of Iron Maiden! !, Slash, Ministry, Michael Jackson’s Thriller, The Secret Art Careers of pro-wrestler Jerry “The King” Lawler and Phil Hartman! I love the ’80s Villains! God, that’s just the tip of the iceberg! This book is beyond clogged!! Book Four – SOLD OUT!!! Features exclusive art posters from Tara Mcpherson, Brian Ewing. 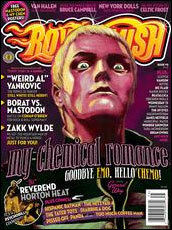 My Chemical Romance cover story, with art from vocalist, Gerard Way! Michael Anthony, Beatallica, Borat, Bruce Campbell, Clutch, Dresden Dolls, Glenn Danzig, Brian Ewing, Jimmy Fallon, Rick Flair, James Hetfield, Tara McPherson, Robert Mitchum, Municipal Waste, My Chemical Romance, New York Dolls, The 69 Eyes, Weird Al Yankovic, Zakk Wylde and so much more! Tackling the comic world, indie artists like Tara Mcpherson, Brian Ewing, Seldon Hunt, R. Black, Jesse Phillips and Jason Goad can be found in the 136-page, full color issue. Book Three – SOLD OUT!!! It¹s all here, folks! The 25th anniversary of the Misfits featuring Jerry Only interview. Interviews with Chris Jericho, The Supersuckers, Gwar and over 48 pages of the best underground comics like Hispanic Batman, The Tater Tots, Tommy Atomic, The Mitzvah Four and Undercover Guidette. It¹s good art for bad kids! Hurry up because we are definitely running low on this hot collector¹s issue! Book Two – Sold Out! The truth about Wendy¹s Dave Thomas, Godbots, Hispanic Batman saves the Latin Grammys and The Million Dollar Man Ted DiBiase teaches you his signature sleeper hold. Every book comes with a free Royal Flush CD! Book One – Sold Out! The critically acclaimed 1st issue that set the publishing world on fire! 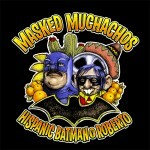 Featuring the debuts of Hispanic Batman, The Mitzvah 4 and the Man Who Beats Priests. Also an all-star salute to Karate Kid bad-boy, Billy Zabka. 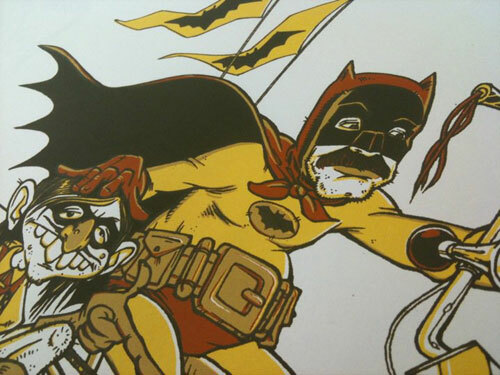 This limited edition silkscreen was done by the dastardly devilish artist Jesse Philips and hand-screened by 100 Degrees! 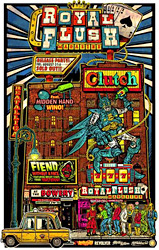 These were done in conjunction for Royal Flush’s mega-release party at The Bowery Ballroom, where Clutch, Fiend Without a Face and Beatallica rocked the house. Royal Flush V Release Party Poster – SOLD OUT!!! legendary Royal Flush Magazine Release Party Posters.